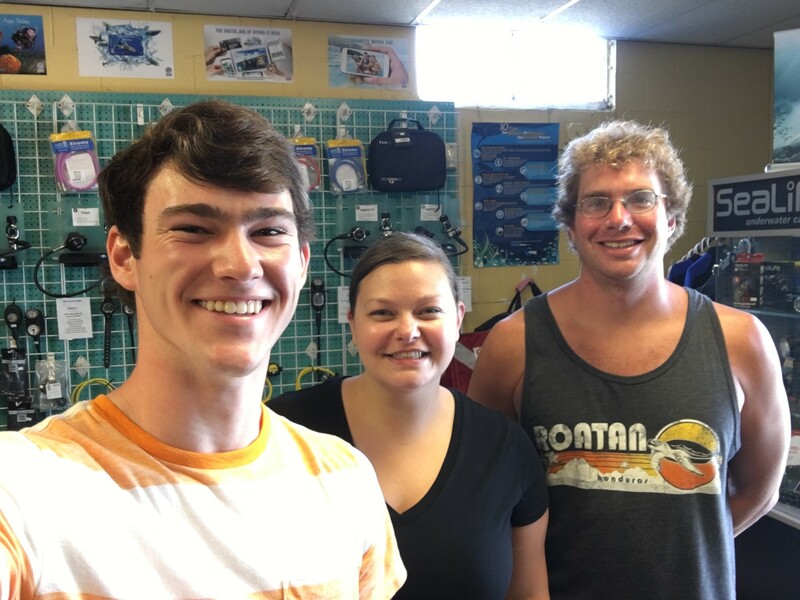 Undersea Divers with Whitney and Shaun! 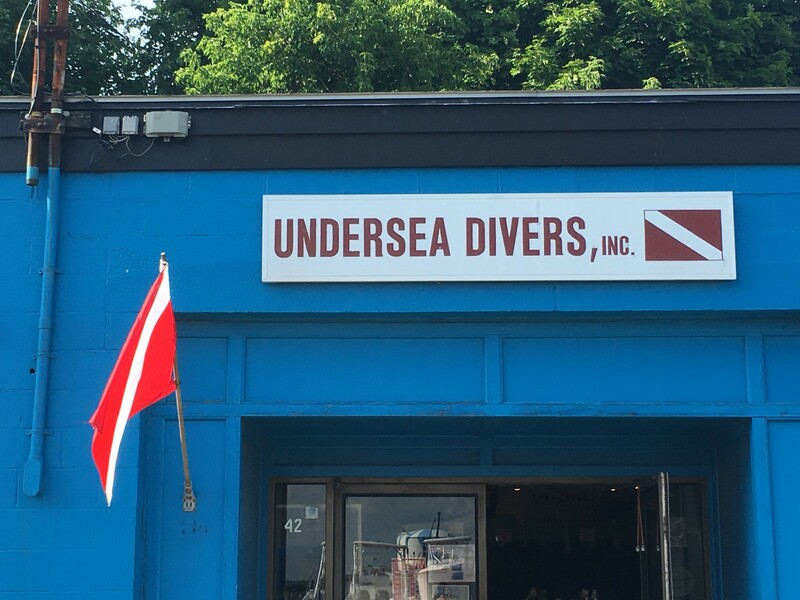 It was great to go back to Undersea Divers and volunteer at the shop for a few days. 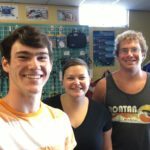 I enjoyed reconnecting with Whitney and Shaun and helping them out with an array of different tasks. 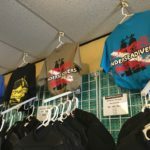 By the end of my time at Undersea Divers, I knew the shop much better and gained a greater understanding of what it’s like to manage a dive shop, especially one with such strong local ties. It was nice to see so many return customers who love to stay and socialize. Some of the tasks I helped out with included: taking store inventories, cleaning and distributing rental gear, maintaining store displays, organizing waivers and forms for customers, organizing incoming certification cards, and my favorite job of all, filling tanks. It’s amazing how much I learned over the course of my time here. I look forward to staying in touch with Whitney and Shaun and hopefully swinging by the shop often. 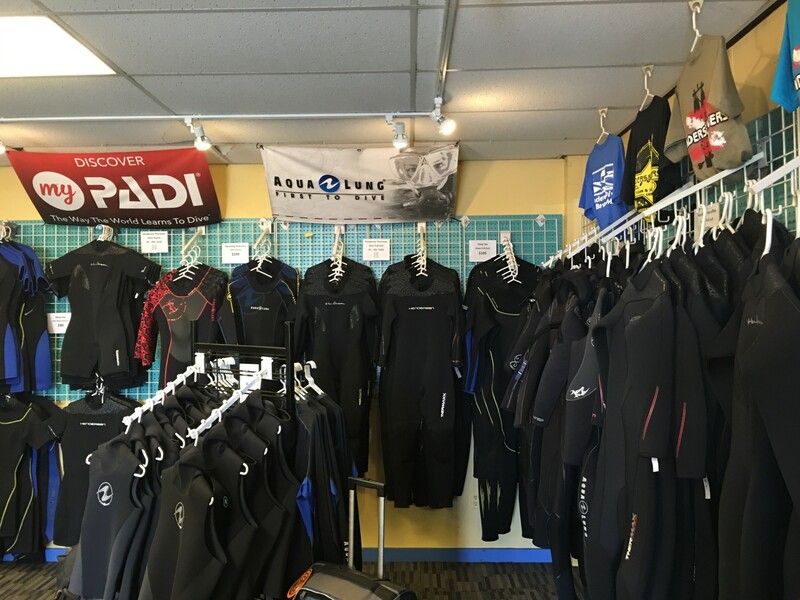 The amount of time and effort these two put into the running of the shop is admirable and it was rewarding to work with individuals who are so dedicated to their work, customers, and to the sport of scuba diving. Thanks so much for having me, Whitney and Shaun! 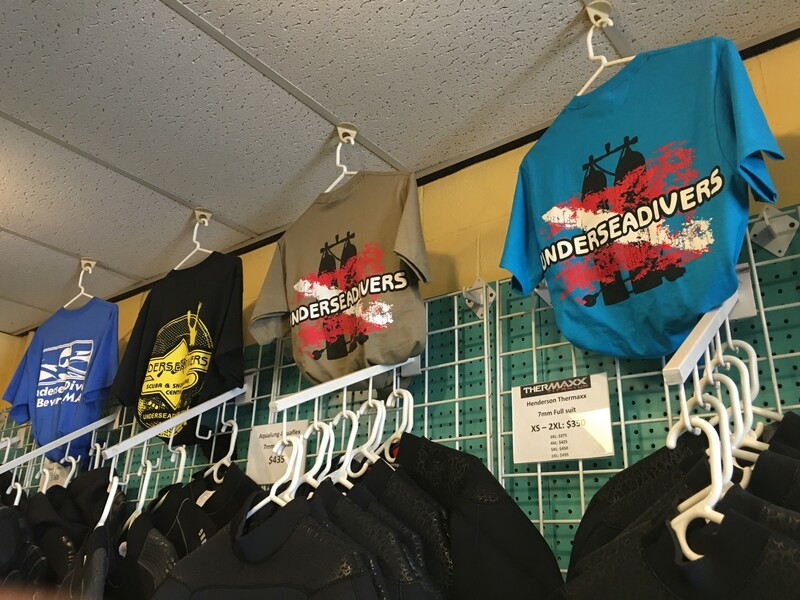 Undersea Divers apparel. Get yours today!! 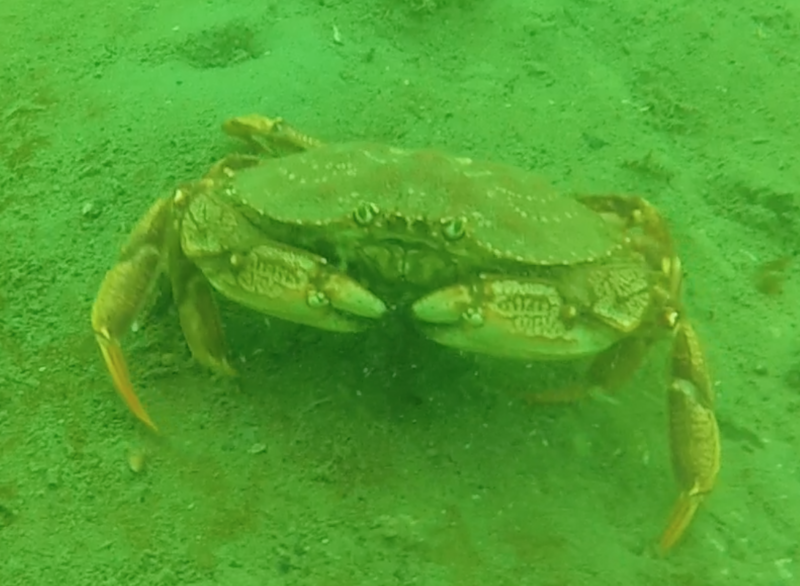 I was excited to get in the water with Mike Lodise from Backscatter and try out my new GoPro rig. The setup that Backscatter has donated for my internship consists of a Hero 3+ camera in a dual-grip tray with two Sola 2000 video lights. 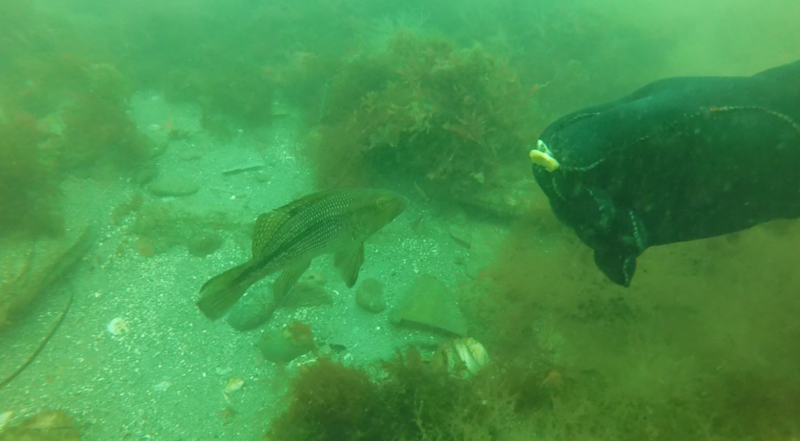 Mike took me diving at Nubble Lighthouse in York, ME to try out this new system. The visibility was great and we saw many lobsters, flounders, and pollock. Using the camera was lots of fun. 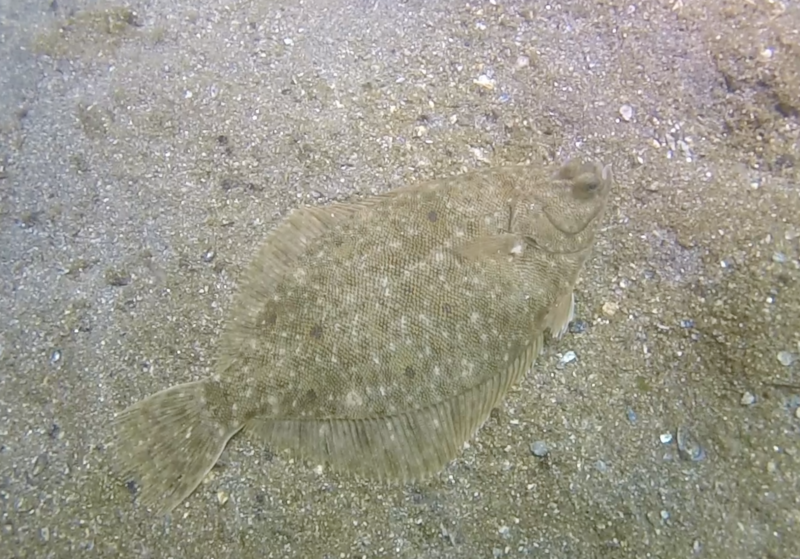 I spent most of my time videoing and interacting with the bottom dwelling flounder. The video lights were great for illuminating cracks, crevices, and overhangs which would otherwise be too dark to see into. 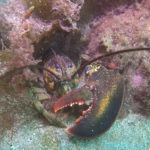 I found lots of hiding lobsters this way. I found that the dual handled tray helped my stability greatly while filming, which is a huge benefit for film quality. Finally, the GoPro was fitted with a magenta filter which helps restore natural color to the captured images. This made all my videos come through much more colorfully, which looks great! Thanks so much for taking me out, Mike, and helping get set up with all this great gear. 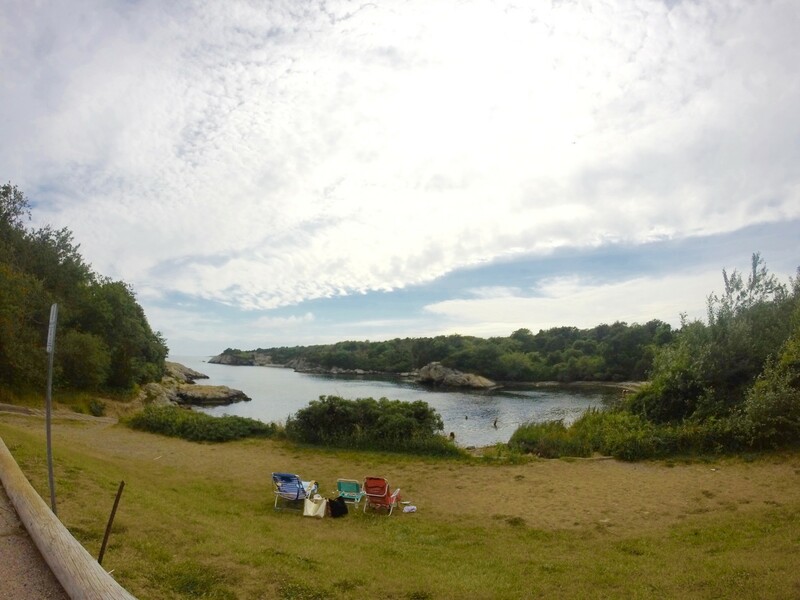 My second day with Rick we dove at familiar dive site, Fort Wetherill. 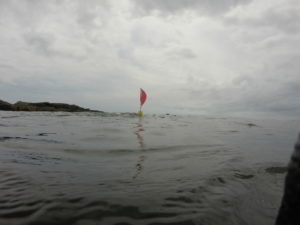 This day was dedicated to practicing new skills such as fin maneuvers, properly using my new reel, and deploying surface marker buoys. 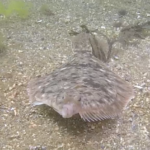 I learned how to use my fins to frog kick and even move in reverse. 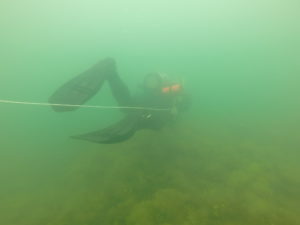 These techniques can be useful when a diver wants to minimize fin movement and silt stir-up. 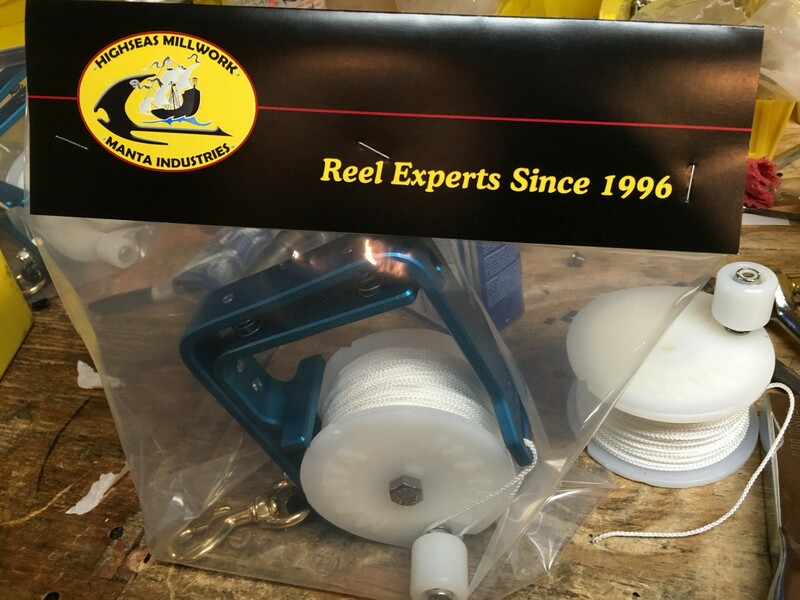 I also learned the best way to tie off a reel, keep it from dragging on the bottom, and use it to navigate underwater. 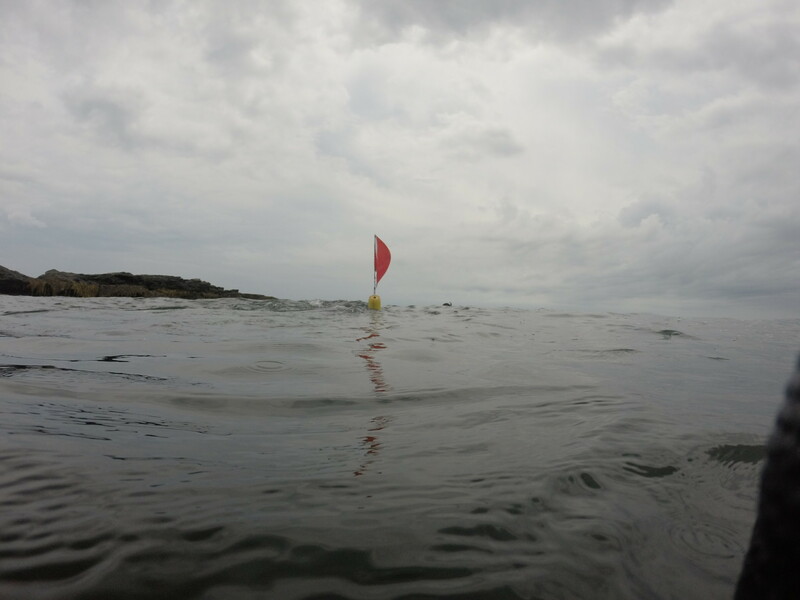 We also practiced using surface marker buoys. 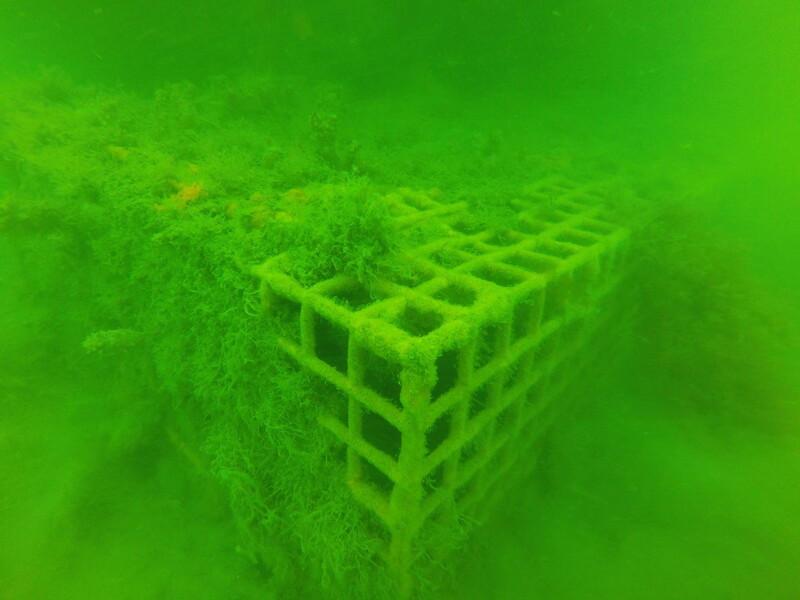 It took me a few tries to get a feel for how much air the bladders should hold before releasing, but shooting the buoys to the surface was lots of fun. Finally, we calculated my underwater breathing rate known more formally as a Surface Air Consumption (SAC) rate. We calculated this rate both in a standard swimming situation and in a case of full exertion. 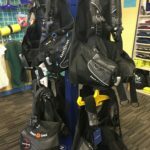 These rates are important to know when planning a dive, for you can determine how quickly you will consume your air depending on the expected conditions. I learned a lot from diving with Rick and I thank him for both his time and investment in me as a diver. 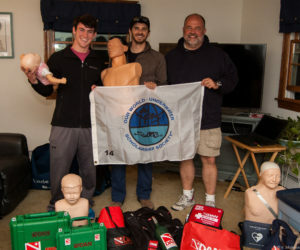 I was lucky to spend two days with accomplished diver and former Frank Scalli Intern, Rick Simon. 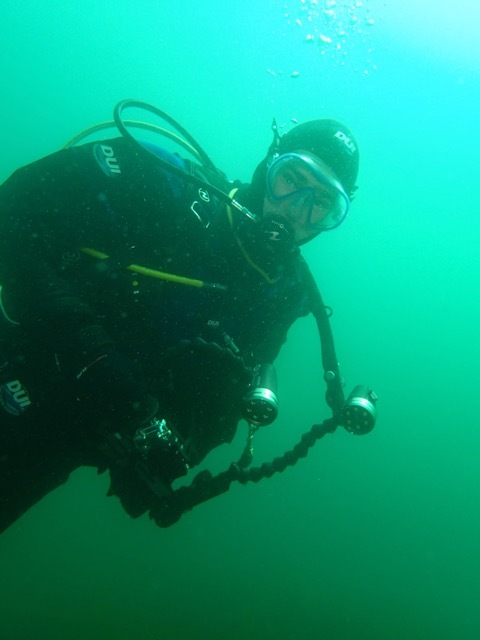 Rick has an incredible amount of dive experience especially in the fields of technical and commercial diving. 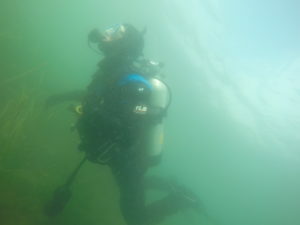 He passed a number of tips along to me and certainly made me a better diver. I look forward to hopefully working with Rick again later this summer. 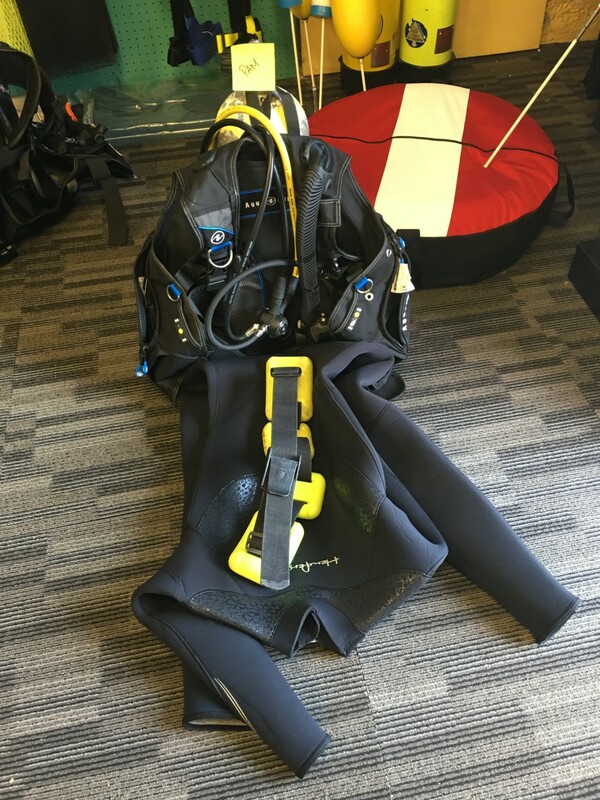 During my first day with Rick, I learned a number of things about diving, without even getting in the water! 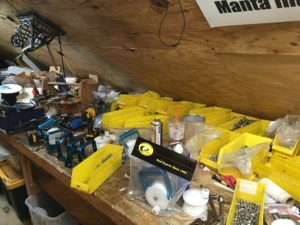 When I arrived at Rick’s workplace in Connecticut, he showed me the ins and outs of rebreathers, as he was disassembling his from a previous dive. 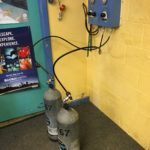 It was fascinating to learn about the mechanics of rebreather function, use, and maintenance. Later, Rick helped me buff up on my dive planning skills, something I rarely employ, as I have done primarily recreational, relaxed dives in tropical waters. 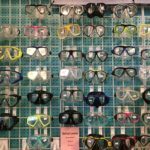 Dive plans are paramount to the success of a dive, but especially useful when conditions make it more difficult to communicate underwater, like low visibility or a mission which requires divers to split apart. 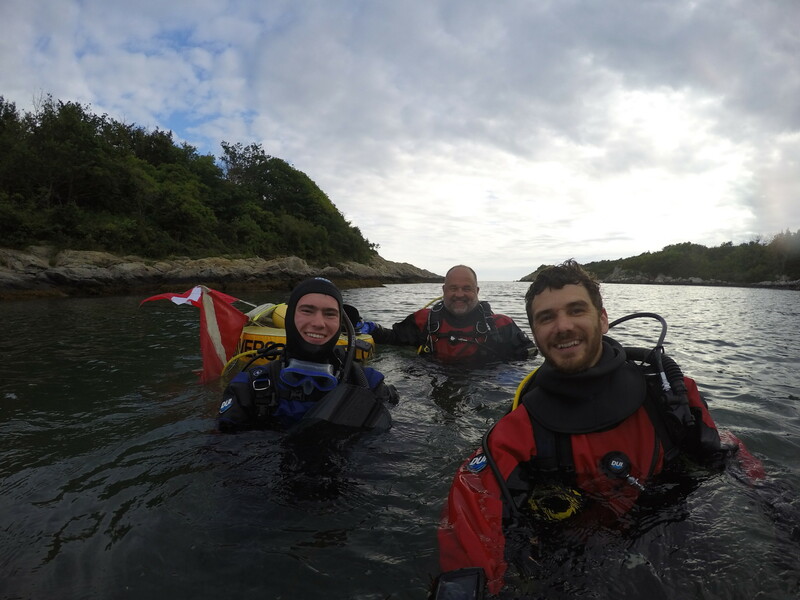 I plan to implement dive plans more frequently when I am in the water, especially as I gain more certifications and get more thoroughly involved in the dive community. 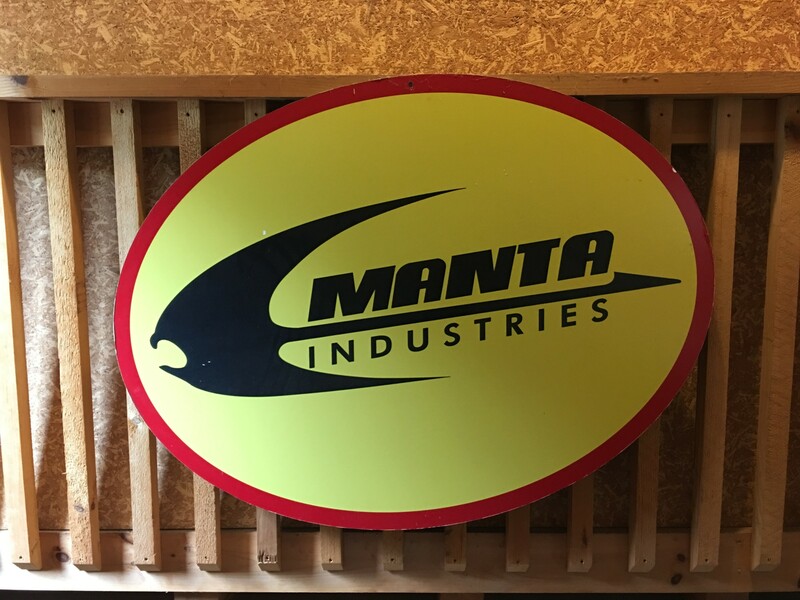 Lastly, Rick showed me how to assemble products to fill orders for his company, Manta Industries. 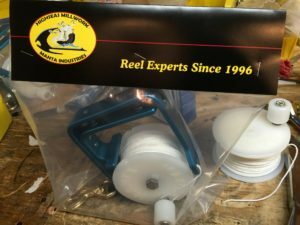 We built a number of underwater reels together. Rick was very generous and donated a reel for my own use during my internship. I even built it myself! Thank you so much for donating this great tool, Rick! My new reel! Thanks, Rick! Today, I completed my DFA Pro course with instructor and friend Chris Millbern. Chris is an EMT, so there was no one better to teach me this hands on class; he had lots of personal insight to offer. 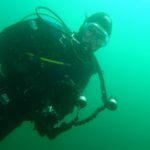 This course provides divers with the knowledge and skills necessary to conduct primary care at the professional level. 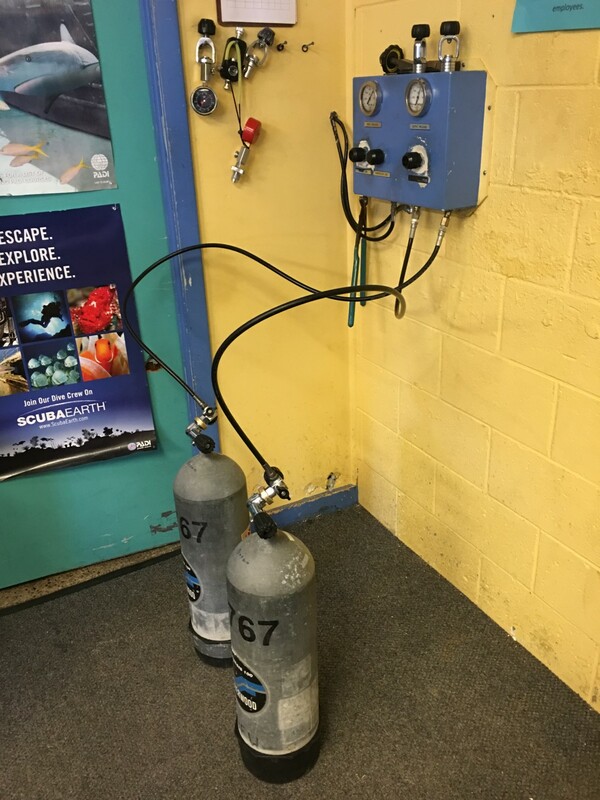 I learned about oxygen administration, neurological assessments, hazardous marine life injuries, other dive-related injuries, and basic CPR and AED operation. We practiced everything from the proper application of latex gloves to performing chest compressions at the correct frequency and with the force necessary to circulate blood. Practicing these techniques (and many others) was both incredibly helpful and educational. 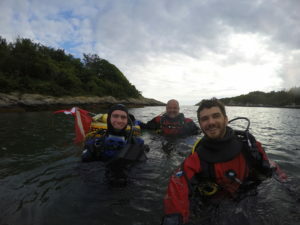 This course is incredibly beneficial to any diver’s skillset and has prepared me to assist in the event of an emergency, dive related or other. Thanks, Chris, for lending me your time to teach; I appreciate it! 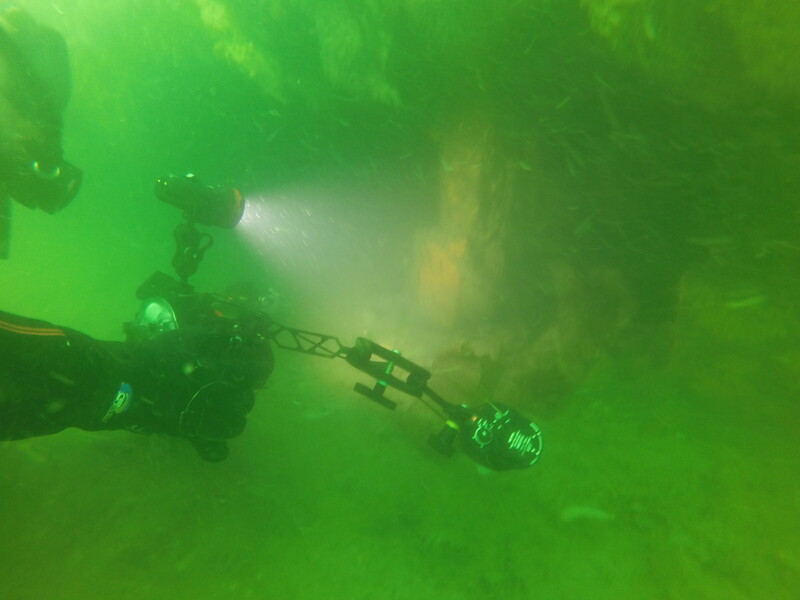 I was excited to dive with Vin again. 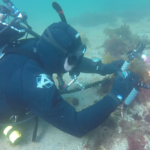 This time I was able to observe and take part in his work with the Department of Marine Fisheries to monitor the health of artificial reefs at Sculpin Ledge in Boston Harbor. 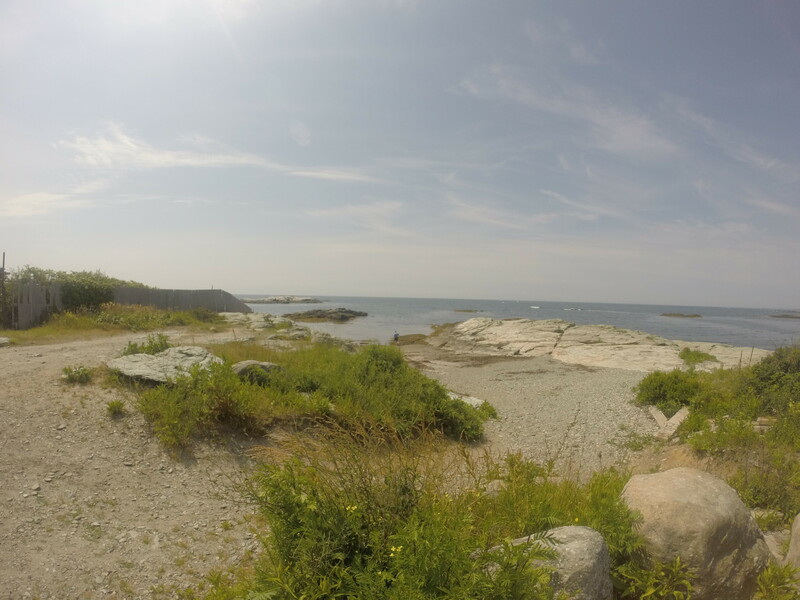 Our day started bright and early at the State Pier in Gloucester, MA. We then journeyed by boat roughly an hour and a half down the coast to our dive location in Boston. 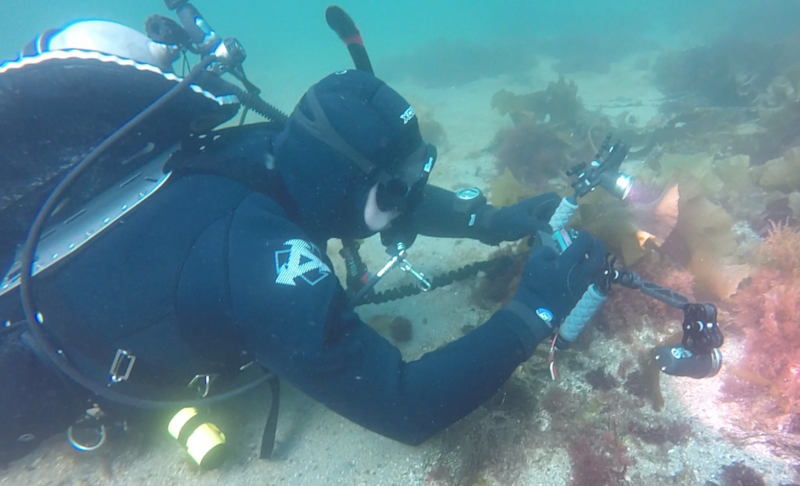 We conducted two dives, monitoring two separate locations. 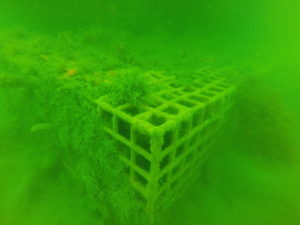 It was interesting to get involved with this work; I never even knew these artificial reefs existed! We saw lots of life underwater including fish like tautog and cunner as well as crabs, lobsters, and anemones. 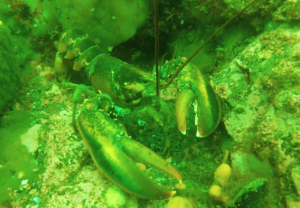 We documented every species we saw (plants and animals) so that we maintain a strong understanding of the community at these sites and how it changes over time. Thanks for inviting me to this cool opportunity, Vin! 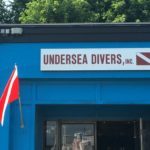 Last Wednesday, I had the opportunity to dive with Ted Maney, a biology instructor and underwater researcher at Salem State University. 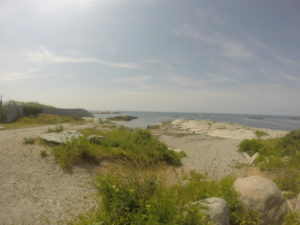 I participated with two of his graduate students in an ongoing sea urchin survey project at Halfway Rock, a landmark roughly halfway between Gloucester and Boston. The urchin count began over 40 years ago and is still taking place today. 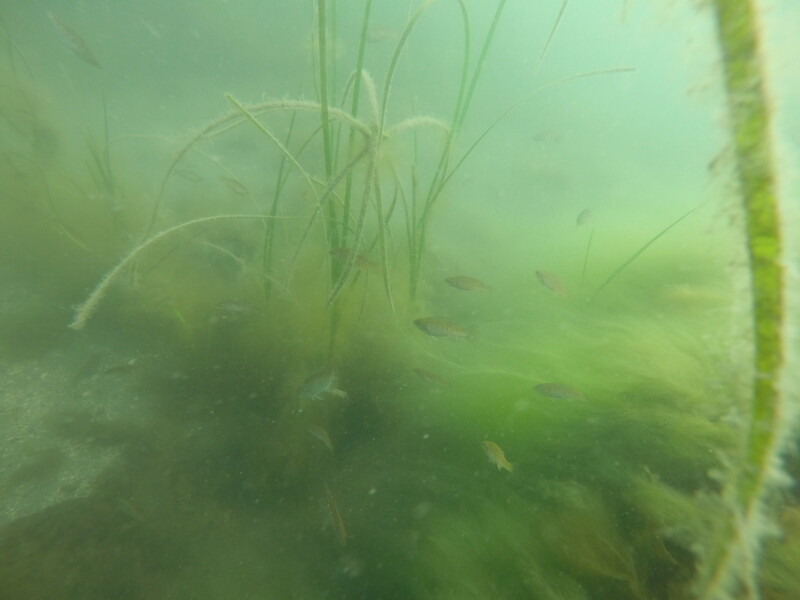 The abundance of urchins at Halfway surprised me. I used a 0.5 meter x 0.5 meter quadrat to measure urchin densities. 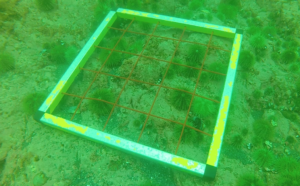 I found as many as 40 urchins in 1/16th of a square meter. I covered a total of 8 square meters of rocky surface during the course of my measurements. 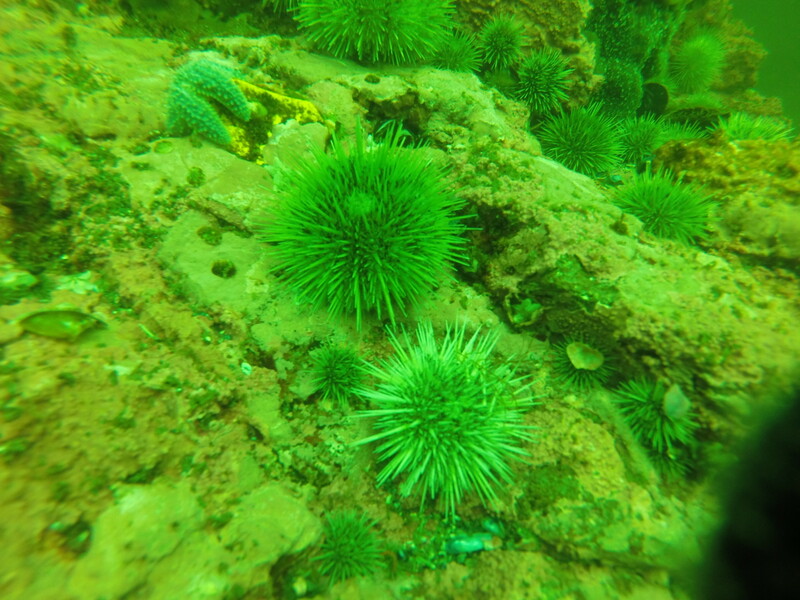 This data will help Salem State University’s researchers monitor the change in urchin populations from year to year. Thanks so much, Ted, for taking me out on this expedition with your crew! I had a great time with Mike Lodise while visiting Backscatter East in Derry, New Hampshire. Backscatter is a company which specializes in underwater photo and video. 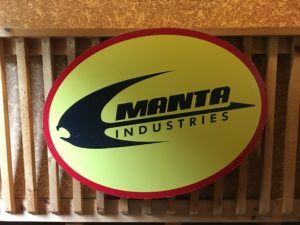 They have another location in Monterey, California, which I hope to visit in the future. During my time with Mike, I learned quite a bit about the mechanics of underwater photography and the many different camera and lighting options available to divers. I learned about the difference between photo and video lights, and learned more about the best ways to augment my GoPro for personal use. While I am still an amateur in the realm of photography, hearing all that Mike had to share was truly fascinating and intriguing. I look forward to improving my camera skill as my internship progresses. I will be diving with Mike next week so that he can give me some tips and practice with photography in the field. I can’t wait! Thanks so much for all your help, Mike. For our second day of diving, Vin took me (and Chris) to King’s Beach in Rhode Island. 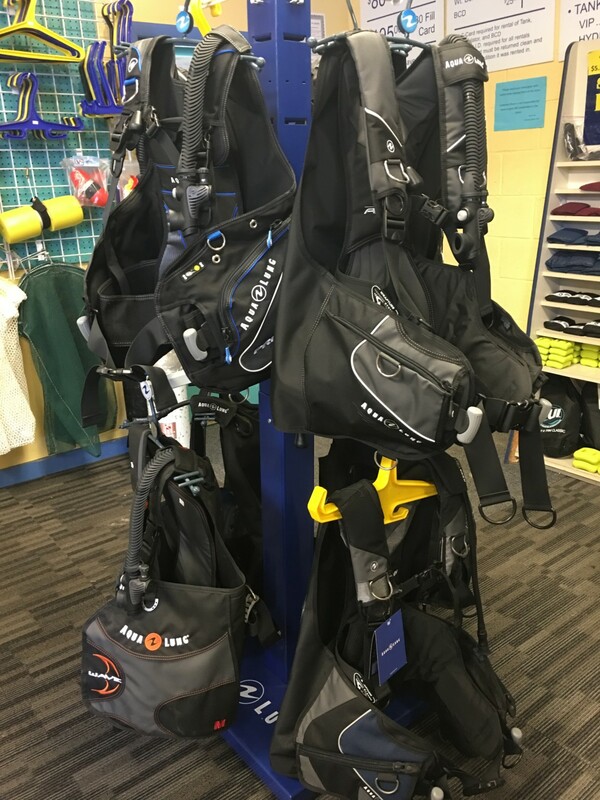 Our mission for the day was to acquaint me with my new Diving Unlimited International (DUI) drysuit and with some of the techniques and skills necessary to be a successful drysuit diver. (A big thanks goes out to Faith and the DUI staff for fitting me for this great suit!) We completed two dives this day. Our max depth for both of the dives was about 30 feet and our dives lasted about 50 minutes each. On our first dive, we practiced drysuit skills such as removing weights underwater, doffing and donning a BCD underwater, and preventing a runaway accent due to the overinflation of the drysuit. 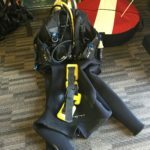 After only a few dives in my drysuit, I already feel very comfortable in it. Thanks for all the help, Vin! 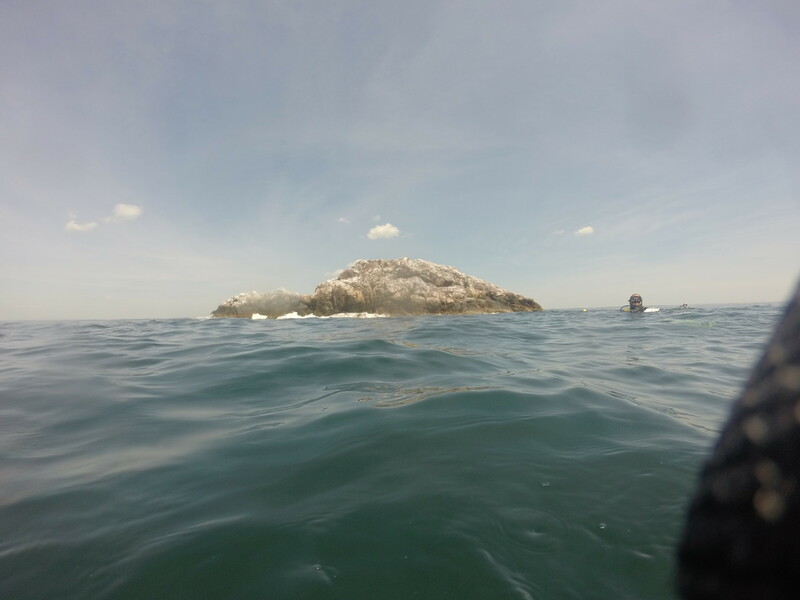 On our second dive, we spent more time exploring the environment and interacting with the wildlife. Vin showed me how to feed clams to the small fish, like cunners, in the region. It was so much fun hand-feeding the fish! 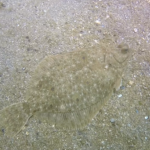 On our dives we also saw a number of skates and flounder. 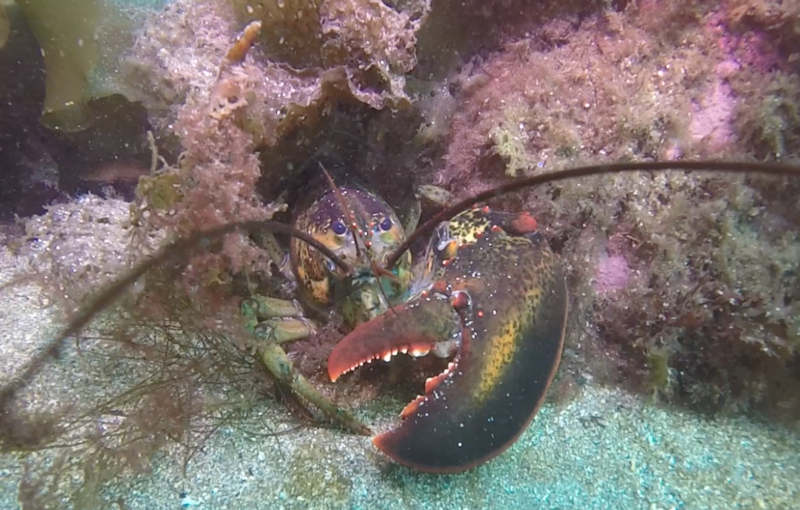 I had a great time at King’s Beach and it was a really good dive site. 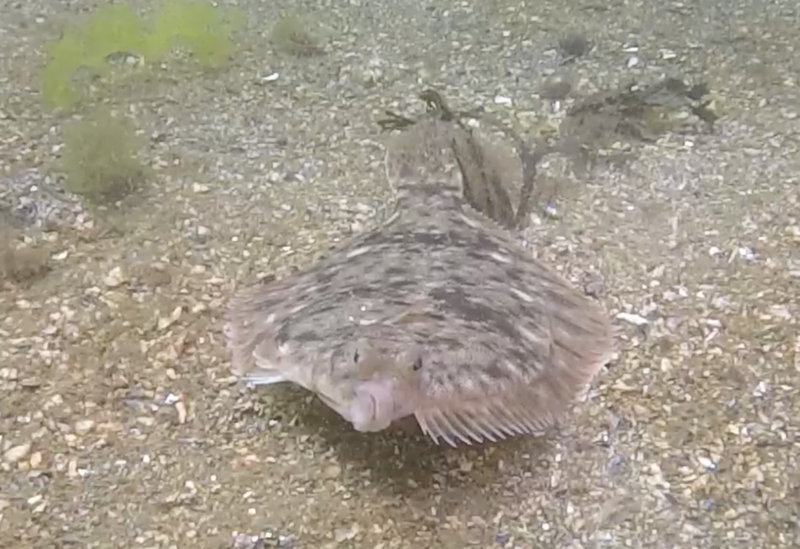 When I heard Vin would be taking me out to dive in Rhode Island, I was really excited. 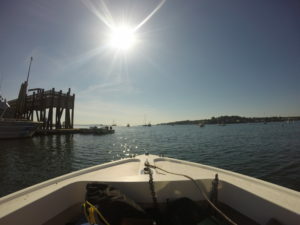 Despite being born and raised in the Boston area, I had never actually been diving in the New England region. 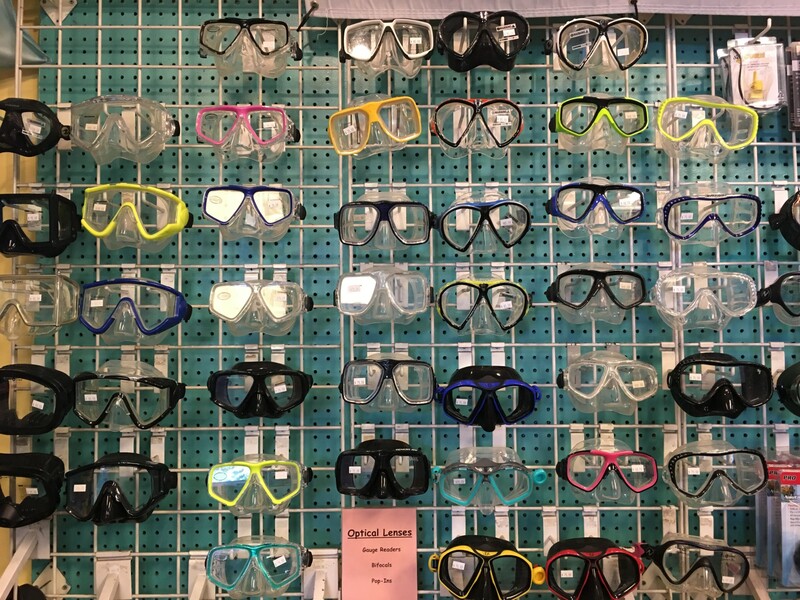 Having never scuba dived in water much colder than 75 degrees, I wasn’t sure what to expect. However, my new 7-mm wetsuit kept me surprisingly warm, and I was able to thoroughly enjoy my bottom time at Fort Witherall. 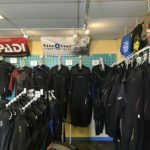 Our dives here served primarily as a skills review and a chance for me to get comfortable with some new gear in preparation for all the work I will be doing this summer. 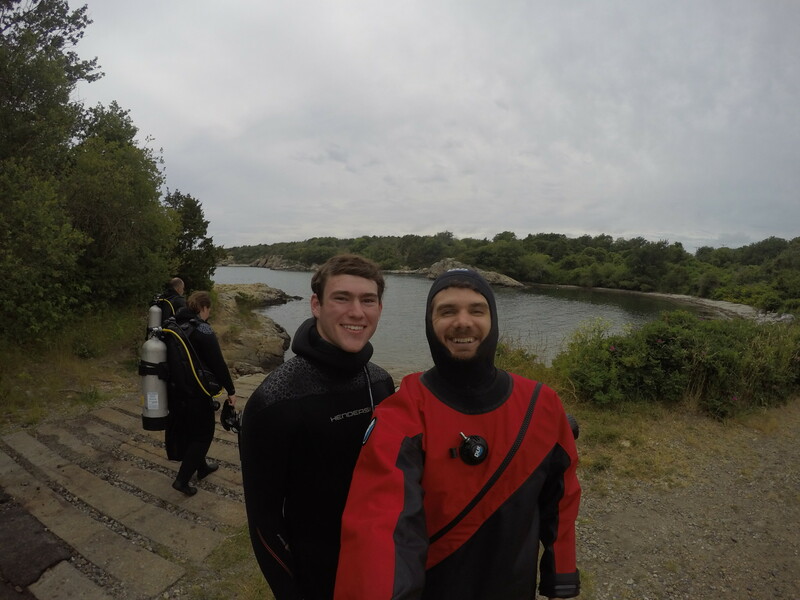 I was lucky to also be able to dive with Chris Millbern, the Our World Underwater Scholarship Society Rolex Scholar. After a long day of diving, Vin took me out to dinner at at Buffalo Wild Wings. “B-Dubs” is always a great meal, and it was great socializing with Chris, Vin, and his family.